Let's see how PFA members we can get to this event. Put this in your calendar people, it's back on the foreshore. Might even have my car going by then! Changing my mind and going to two knock sensors has slowed it down. I've now retired and have weekends off so I might go in if the weathers ok.
You need to come into cars and coffee Newcastle mate, mid February is the next one but if you want to catch up before that send me a PM. TINGY i'm up for it got nothing on in Feb , let me know time and place. Newcastle has got nowhere to park these days has it? Most of us attending will be showing our cars so we will be ok for parking. I'm actually quite looking forward to this. Don't know what I'll be driving though! Tingy996 what time date and address for cars and coffee? Tried to PM you but stuffed it up thanks Dobbo. I'm keen to head up to this. Is there a meeting place and/or time? What time does it normally finish? 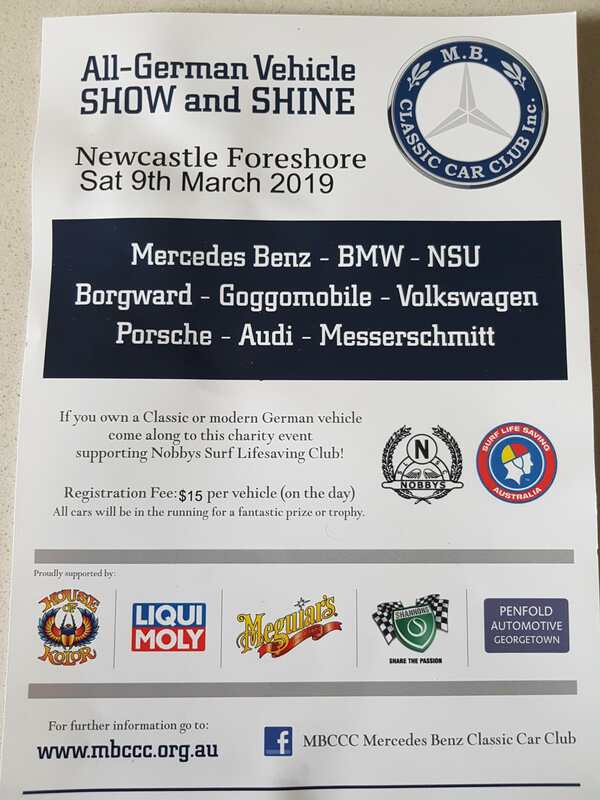 I'm planning to head up and have a look at the Classic car show up at Hawks Nest to - probably leave Newcastle around lunch. Not sure on an official finish time, but you are free to leave when you want. I will possibly heading up via Tea Gardens on my way home to Port Macquarie after lunch anyway. Happy to cruze up in convoy. I am coming down to Newcastle on the Friday and was going to ask about a meeting point and time from some of the local Newcastle crew for the Saturday morning.. Sounds great @Port 911 - my old man lives up your way, and is taking his E-Type down to Hawks Nest - hence the plan to split my time on the day. I think you have to be there at 8.30am if you want to enter your car. I'm going to head in look for a crappy old white 928 see you there Dobbo. There is normally a pretty good Porsche turn out for this event, lets hope the same this year. Thanks, I'll aim to be there before 8.30. A few of us will be meeting somewhere on the way to convoy in together if you want to join us. Yes, love to. I'll be coming up from Sydney with my cousin in an M2. Let me know where you're meeting and when and I'll be there. MB CLASSIC CAR CLUB INC annual ALL GERMAN DAY SHOW & SHINE. Our clubs flagship event will be held on Newcastle's beautiful Harbor Foreshore Park. Right under historic Fort Scratchly. Cars to be parked by 9am. Prizes for many catagories. $15 per vehicle. This event supports Nobby's Surf Club. We welcome all German branded cars,bikes,bus's as well as special interest german Vehicles such as fire trucks etc. All German makes such as Mercedes, BMW, Audi, VW goggomobile plus many more.German branded clubs should place this event on your schedule. Food on site as well as Coffee. So come along and experience this great event thats now in its 11th year. Soak up the splendor that is All German vehicles on display. @dreamr Are you going and if so, have you figured out if there are a few of you meeting somewhere to drive up there like we did last year? If it's not raining, I'm going up but it won't be in a P car ... I'm taking the Junior up on a trailer. @SteveF is meeting me at mine and mooching a lift up .. I'll get in touch with @TINGY996 and see if he want to meet up at the Carpark like last year ..